I’m not a huge meat eater. But I’ve been eating red meat more often lately. I’m not crazy about cooking and handling raw meat. I’m a bit of a germaphobe. But more importantly, I really liked the idea of having a positive impact on the environment by curtailing my meat consumption. I’ve also been aware for over a decade that I’m iron deficient, which is pretty common for women of child-bearing age. I thought I could get enough iron by eating greens, tofu, herbs, and multivitamins. I know of many women who are perfectly healthy leading a vegetarian or vegan lifestyle. So why not me? But after a year of barely any red meat (or any meat for that matter), I was wrecked by constant fatigue, frequent headaches, dark circles under the eyes, among other symptoms. Apparently, I’m one of those people who need heme iron source (iron from meat) in their diet. Although I feel some guilt over my failure as a vegetarian/vegan, I feel a million times better physically. Even now, I don’t have beef that often – maybe once a week or so. And I try to stick to organic grass-fed beef. But when I do have it, bulgogi (grilled or sauteed marinated sliced beef) or galbi (grilled marinated ribs) is at the top of the list. Just the right amount of salty and sweet. Mmm… So delicious. I also love ddukbokki (or tteokbokki, depending on who you ask). And bulgogi and ddukbokki together is just heavenly. 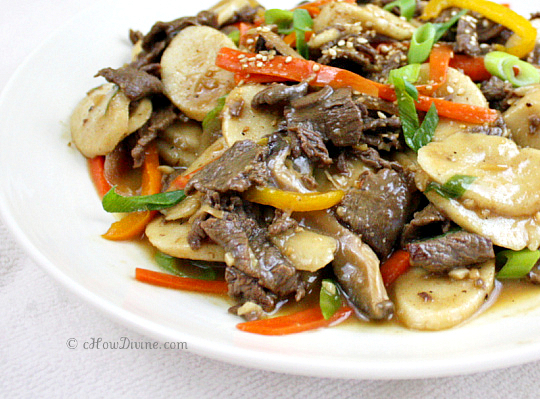 The flavorful meat, the soft and chewy rice cakes, and the thick sauce that coats all of the ingredients are just three of many reasons to try this dish. It is also pretty easy to make. And the actual cooking time is very short due to the thinness of all of the ingredients that comprise the dish. And the taste? Wow. It was even better than I expected. 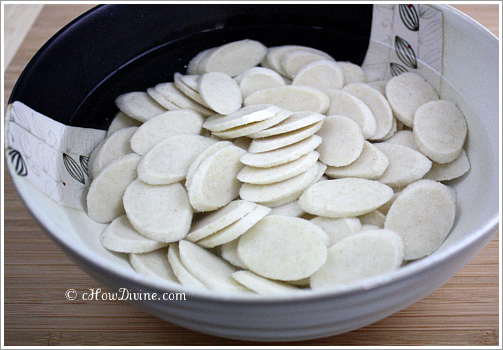 *Note: I am using sliced dduk for this recipe instead of the tubular/cylindrical dduk, which is traditionally used in ddukbokki. They soften considerably quicker than the tubular ones – within a few minutes. In a small bowl, stir together tamari, agave nectar or sugar, toasted sesame oil, minced garlic, white parts of green onion, and black pepper. Set the marinade aside. 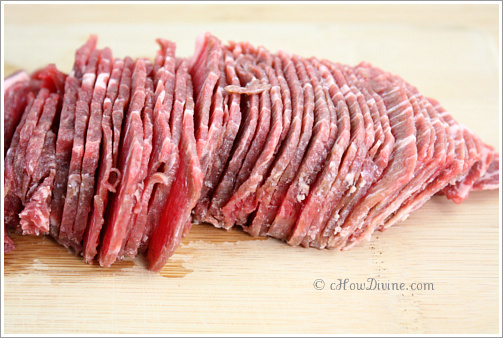 Slice the beef very thin – close to paper thin. This will be much easier if the beef is partially frozen. The meat should be appear frozen, but give slightly when pushed with a finger. Add about 1/2 of the marinade from step 1 and sliced onions to the sliced beef. Marinate for about an hour. You can marinate in a ziploc bag for an easy cleanup. While the beef is marinating, soak dduk in cold water for at least 20 minutes. Drain well. 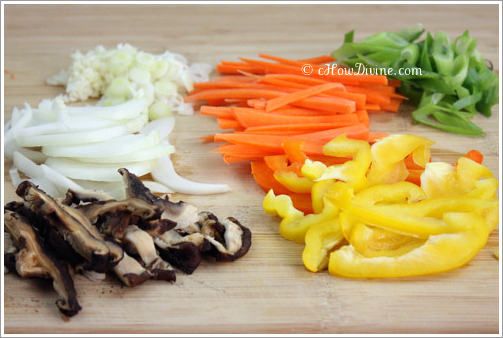 You can also prep the vegetables during this time. Heat a pan over medium heat. Once heated, add just enough canola oil to coat the pan. 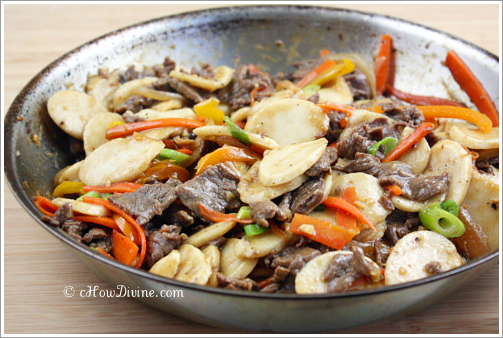 Sauté the beef until JUST cooked. This should happen very quickly because of the thinness of the beef. Add mushrooms and sauté for about a minute. Add the carrots and other vegetables and sauté for about another minute or two. Add about 1/2 cup of water to the leftover marinade. Add this diluted marinade and dduk (rice cakes) to the pan. Stir until the dduk softens, sauce thickens, and a shiny glaze covers the dduk. Don’t overcook; the dduk will become mushy and release too much starch into the sauce. If the sauce becomes too thick, add more water to thin it out. Stir in the chopped green onions (the green parts) just before the heat is turned off. Sprinkle on some toasted sesame seeds and serve immediately while hot. When it comes to those chewy rice pieces, you will not find anyone crazier than i am! I pop them like sweets!!! They are really good. My grandmother used to just warm them up & dip them in honey or syrup. So yum! Ooh, I didn’t know there was such a dish. I would love to get the recipe! love this bulgoggi rice cake dish. 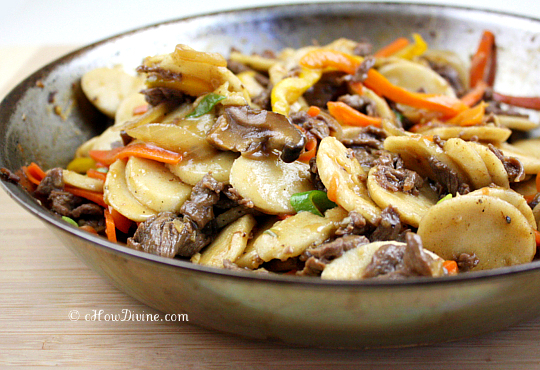 I love bulgogi but like you I also try to cut down my meat consumption lately. I’d love to give this recipe a try sometime soon. Try it! There isn’t too much meat in this dish. It’s mostly the chewy & yummy rice cakes! The Blood Type diet might have the answer to your conundrum, if you have O type blood. I’m O+ and I had the same problem. I was vegetarian for quite a while and all the sudden, I was borderline anemic, unable to pass those basic iron tests at the blood donation clinic. Once I added red meat back into my diet, the problem cleared up within 6 months. Interesting you mentioned that! I know some say it’s kind of voodoo magic, but I’ve been sort of following it for a while. It’s better than anything else I’ve seen so far. I have a pretty sensitive digestive system (probably genetic). So I’m pretty careful. No gluten, most types of dairy are out, nothing smoked…sigh…and so on. Good to know someone else has had success on it. Thanks for sharing. Have you considered adding several social bookmarking buttons to these blogs. At the very least for twitter. The button is at the bottom. If you click on the share button, the selections should show. Twitter should be among the top of the list. Let me know if you have problems. Thanks! Ooh what a great idea! I love teok bokki. I’ve been seeing lots of different versions of it. I am going to have to try this, too! Surprisingly I’ve been preferring these over the spicy version lately. I’m usually a spicy fanatic! I made this tonight. Yum! We loved it! I will definately make this again! Looks delish! I just bought some of the rice cake and was looking for ideas. I’ll probably something like this. My wife is mostly vegetarian, but she will be out tonight, so it’s going to be burger that I have on hand…maybe Chinese meatballs. I have to say, if you are a bit of a germaphobe, beef is probably one of the lower risk meats, and chicken is probably the highest. The less processed, the safer; because the culprit for contamination is usually a piece of equipment that has not been properly cleaned and sanitized…like a grinder. I also cannot really afford the local grass-fed, organic beef. I know the farmers have greater costs to provide a product like this; but $8-10/lb for ground beef or $30/lb for a steak is just out of my range. As long as I’m buying USDA inspected meat, I’m good.